I am proud owner of a full season of Monk on DVD, and as a child nobody ever had to tell me to tidy up my room. I indulged not only in cleaning my Lego(*) world with a fine paint brush but I rather re-organized all my belongings in Feng-Shui-meets-OCD-style quite often. (*) Lego is a registered trademark… etc. 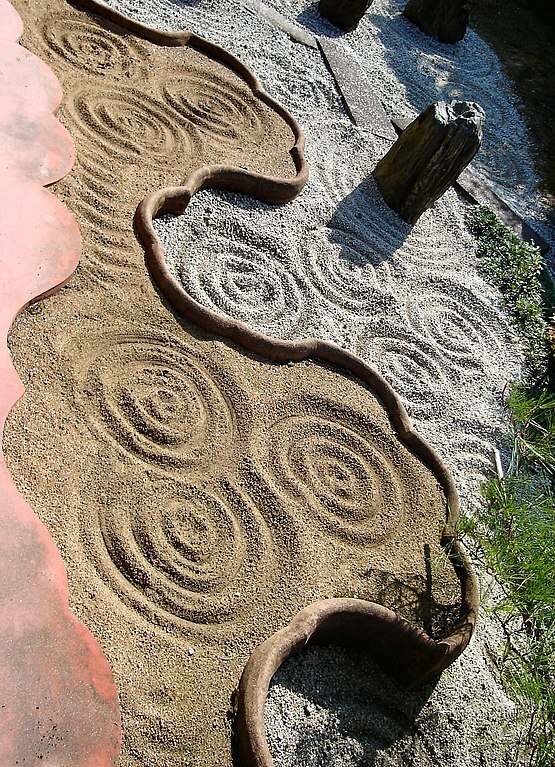 As a consequence I have raked my virtual Zen gardens often, too. Now I have nearly replaced all the gravel in this Zen garden. It’s not that I don’t re-tag and re-categorize often, making extensive use of WordPress’ Tags to Categories Converter that keeps the old links intact. But tags and categories did not do it for me. I have filtered my posts using those in order to group them, e.g. for sending this collection of “relevant links” to somebody else. It is probably a shortcoming of this particular WordPress theme but other than using the search function it is not possible to create a concise list of posts, consisting just of headlines and the first few lines. So I tried to create that views I wanted in the old way: I have now compiled so-called summary pages, listing all blog postings in a certain “main category”. I have just excluded reblogs. Any other article shows up at (at least) one of these new pages linked in the main menu. As a consequence – as the menu bar now really, absolutely, positively says it all – I was able to shorten my extensive tagline which is now much shorter than the blog title. I have absolutely enjoyed this task – as Zen as it can get. All my web sites I have ever run are also experiments in exploring the interplay of structure and content. I believe it is nearly impossible to set up proper “categories” upfront so that you can just assign all posts you ever write to them later. Only bureaucrats believe the world works this way. I have some experience with so-called top-down web projects that end up in epic tombs of a structure nobody is ever bringing to life with “content” – because it is too rigid. But some limitations may not be that bad after all: Boundaries force you to get creative at a new level to hack them and work around. In a twisted sense I love my personal websites’ schema that forces me to attach one main category to every article. It is as much fun as subverting a well-meant survey or questionnaire by using the fields in ways probably not expected by the designer. Another interesting effect I noted again and again is that I enjoy commenting on my own posts, including self-parody. I find it most natural to reflect on old postings by adding a one-liner some months later. On my other sites I take self-reference to bizarre levels and comment on my old German posts in English or commented on comments on comments etc. But to make this work – at least for me – I need to have a look at the old stuff from time to time, and I have to put old images into a new frame, or I need to attach virtual post-its that put everything in a new perspective. This entry was posted in Life the Universe and Everything, Web and tagged About, Announcements, Blogging, Internet, Netizen, Random Thoughts, Writing, WWW by elkement. Bookmark the permalink. Generally my blogs could do with some more organization but the attempt to provide that kind of peters out into fiddling with possible alternate themes instead. I took a look around at the new blog and like what you’ve done with the place. You did not mention how long it took, but I am guessing you were at it in parts over a period of a week or so–perhaps one page per day, maybe? What a wonderful little girl:brushing her LEGO figures, houses, rooms etc. I know it’s not a joke, I have to smile……..
All the statements on this blog are dead serious! Telling me to tidy my room was absolutely futile. I don’t have an ordetly bone in my body, which is weird because I work in security. “In summary, I think I (we?) write and blog in order to remember or discover who we are, were, or want to become. [This is the sort of clichéd statement I will for sure ridicule in a later meta-comment of mine. ]” This makes me aware of how I’ve been reblogging a lot on WordPress lately and spamming my Facebook account with promising links to ideas I’m considering for projects. I also found in the theme I picked that I can do custom menus, so the one on the side bar is categories only, which I reorganized in my last blog “cleaning.” The menu on the top is traditional, and devoted to pages. I also agree that we can’t anticipate where we’ll go in our sites, so the content does get a little messy as it progresses. I also like the simplicity of your blog space. I think I’m going to miss that on my own page, as it feels really cluttered, but then, I spend more time looking at other people’s blogs than I do my own, so maybe it doesn’t matter. 🙂 I’m going to explore your pages now. I don’t find your blog cluttered at all, Michelle! I guess we are all overly critical when it comes to our own virtual spaces. It would be interesting to check out usability studies about what users consider easy to navigate versus cluttered. I like “site maps” / concise list of all links much more than categories or tags – but I don’t know if this is typical. Databases, despite what they may imply, are highly personal to the people who do the actual data entry. I’ve done database “editing” before for organizations, including a library, and after a little bit of poking around in the info I’ve begun to find patterns to the way individuals sort and tag their data. It’s always been very interesting, and very individualized despite the attempts to impose standards. Thanks, Dave – it is always good to hear that others have the same allegedly weird habits. I haven’t changed as well – the Monk DVDs were a present I have been given recently for a reason 😉 I also enjoy doing accounting and controlling a lot, against the mantra of “focus on your core business and outsource the rest to the professionals”. When playing with blogs I think I am either in creation mode or in re-organization mode – I can totally relate to your retrospectives and your new photo website. Also the decision to keep a messy blog as this one versus separate spaces for separate aspects or categories is something to be reconsidered from time to time. I will keeps things united in one blog for now, but this is probably only because I also run some other different websites and blogs that are more “specialized”. I had started this blog, trying to rise to the challenge to unite again what had been separated for so long. Now the one thing I would warn you both about (and yes, I know BOTH of you know this quite well but I have to say it anyway): Seeking order in this world is one of the most satisfying things we can do. No–it’s THE most satisfying thing we can do. That said, there’s a great danger in finding order where there is none; patterns that are not real. Scammers know this. They spam a large number of people making a binary prediction, say, “Exxon stocks will go up tomorrow” to hald and the reverse to the other half. They then cull out the ones for whom they made the wrong prediction and then do it again. They repeat this four or five times until they are down to several hunder potential victims. By now they have made 6 or seven absolutely correct predictions for them and know that a significant number of them probably think they are on to something. So…then the trap falls. They charge for the next prediction and bake the same BS as before, but this time, some of the people pay for it. And all based on creating an artificial sense of order. So whats that got to do with being compulsively tidy and neat? Nothing really, except for the fact that you may expect everything to be, in the end, tidy and neat. I went through exactly this in physics. Until sometime in my early twenties I stuck with the physical sciences, convinced that, at some point physical phenomena would start to make sense. I wanted to know what was really going on down there at the most basic level. The Standard Model, in particular intrigued me, for, year after year I could see more and more building blocks fitting into place. Then, however, at the masters’ level, while pursueing my M.Ed. I decided to pursue, as a thesis topic, an understanding of students’ conceptions of the Nature of science. This caused me to dig much deeper into the philosophy of science that I’d dome previously. Somewhere in that process I located a serious flaw that had remained in my own understanding–despite having done an undergraduate degree in physics and math, as well as science education, and by then having done 12 Masters courses (I only needed 8) in science and math education at the grad level, somewhere in researching my thesis background I realized that I’d managed to remain a naive realist! (Oh and by the way, later on when I did my research it was clear that ALL of the students i my sample were that too). You see, I hated quantum everything. Hated it mainly because to accept it meant turing your back on ever knowing what was really happening because QD, QED and all the other flavours of Q just plain could not ever hope to do that. Now, that’s been over 25 years ago and most of me is still not over it. I still check in on physics from time to time–I’ve even (unsuccessfully) tried to follow the new math of strings and such. But–sadly I know that “knowing what’s really there” and “truly finding order” are things we can never do. Of course I can relate to anything you say, Maurice! As a described in a previous post I still enjoy reading physics textbooks as a mental warm-up exercise in the morning. I finally found the latter more interesting and more rewarding – even though the tasks as such (programming, engineering, debugging, design specifications,…) are considered much more mundane than the noble task of the scientist. Thanks, Judy 🙂 Yes, I think / hope that the new summary pages will help me in balancing anything.